"We have the right to know what is in our food." While GMO proponents say their goal is to increase nutritional benefits or productivity, the two main traits that have been added to date are herbicide tolerance and the ability of the plant to produce its own pesticide. These results have no health benefits, only economic benefits to the companies that produce them, at the cost of significant negative consequences. Genetic modification produces results that otherwise would not appear in nature. Down to Earth is opposed to the development of products containing GMOs because we believe they may pose health, safety, and other potential risks that far outweigh the purported benefits. For details check out the links below to a wide variety of related articles. Down to Earth, along with the natural products industry, strongly supports the Non-GMO Project. 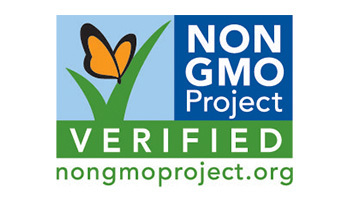 The Non-GMO Project provides manufacturers with the "Non-GMO Project Verified" seal pictured above, which is backed by independent testing. The “Non-GMO Project Verified” seal means that GMO contamination has been avoided throughout the growth and harvesting of crops, their processing, storage and packaging. As of January 2018, there were 48,554 Non-GMO Project Verified products from 3,000+ brands. Collectively, these products represent more than $26 billion in annual sales. As increasing numbers of manufacturers include the “Non-GMO Project Verified” seal on their packaging, you will see more and more of the verified products on our shelves. 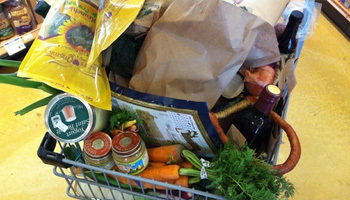 Consumers have the right to choose what foods to eat and feed their families. This Non-GMO logo enables consumers to exercise this right. Download the NEW True Food Shopper’s Guide to avoiding GE foods, updated for 2013, or get the True Food Shoppers Guide mobile application for iPhone and Android!